Almost all of the reviewers were impressed with the support offered by the upper and the sole units as the Nike Free TR V8 felt very stable during training. A significant number of owners claimed that the footgear was very comfortable and made them feel like they were walking on clouds. The bootie construction of the product was lauded by many testers. The glove-like fit of the merchandise was appreciated by plenty of wearers. Multiple shoppers appreciated the footwear’s versatility; it looked good for casual wear and performed excellently at the gym. Several gym-goers liked the flexibility of the product during plyometrics and sprints. The shoe felt very light on the foot, which pleased a few individuals. A consumer stated that the quality of the trainer was worth the price. The bootie style disappointed a minority of buyers because it made the Nike Free TR V8 difficult to wear. Some users complained that the fit was too tight; a few said it needed breaking in to feel comfortable to wear, while others stated they needed to go a size up. The trainer was too soft and did not provide adequate support during workouts, griped a couple of critics. One person wished that the insole was not so flat. The owners of the Nike Free TR V8 exclaimed that it was so comfortable to use that it felt like walking on clouds. This model was also praised for its performance as a gym shoe and all-around footwear. The bootie construction of the trainer resonated well with users because it fit like a sock; however, some thought that it was too tight and hard to put on. Other concerns about the footgear included the lack of overall support. But in the end, the style and comfort of the Nike Free TR V8 satisfied most of the purchasers. For athletes who want a decently stable shoe for casual workouts for a fair price, then the Nike Free TR V8 is a good choice. The Nike Free TR V8 was crafted for male athletes who need reliable footwear for intensive, high-impact workouts. 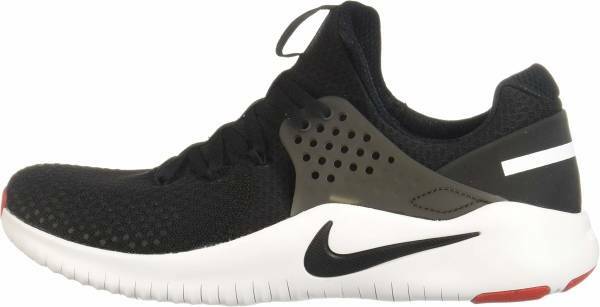 It is an update to the acclaimed Nike Free training shoe series which aims to create flexible and weightless trainers for a natural foot experience. The new model gets a serious makeover compared to its predecessor, the Free Trainer v7. The only reminder of the previous design lies in the half-sleeve upper construction with a fully attached tongue. The lateral and medial sides are now reinforced with the TPU (thermoplastic polyurethane) wings that integrate with the lacing system for a locked-down fit and support. The foam midsole is made thicker in the new version. It extends up on both sides to cradle the foot for extra stability during side-to-side movements. The outsole ditched the triangular-shaped cuts in favor of a hexagonal pattern. It is meant to give more flexibility during multi-directional movements. The platform overall has been made wider for added steadiness. More cuts have been added throughout the sole for maximized pliability. The overall construction of the shoe makes it very similar to the Nike Free x Metcon, one of the brand’s acclaimed CrossFit shoes. The latter sports a sturdier and more reinforced to keep up with weightlifting and rope climbing exercises involved in a WOD. The Nike Free TR V8 is a male counterpart of the Nike Free TR8. It comes in US sizes 6 to 15 with half sizes available as well. It is offered in a standard D - Medium width. The fit can be adjusted with the help of a lacing system that also tightens and loosens the TPU wings on the sides. The bottom part of the Nike Free midsole is dissected by hexagonal cuts. They allow the platform to bend in multiple directions, helping the foot move seamlessly throughout the training session. The edges on both sides of the sole have an abundance of flex grooves that contribute to the flexibility. Rubber pods are added in the key areas of the outsole. They provide grip on gym surfaces and protect the platform from abrasion. The rubber compound at the front part also serves as a toe bumper for burpees and other exercises. The Nike Free TR V8 sports a full-length EVA foam for lightweight cushioning. The back and side portions of the unit extend up to form a cradle. This construction keeps the foot in place during lateral movements. A combination of textile and synthetics makes up the upper unit of the trainer. The material on the forefoot has a more open construction than the rest of the unit. Its ventilation pores help in keeping the inside aerated. A thick synthetic overlay wraps the back of the shoe to form a heel counter. It is made firm to afford stability in the rearfoot. The TPU wings render additional support on both sides of the footwear. Integrated with the lacing system, they lock the foot in the ankle area to provide lateral stability. The flat laces easily slide through the metal eyelets, allowing for a quick fit adjustment. The Flywire cables can be seen in some of the eyelets. They become taut when the laces are tightened to give extra support in the midfoot. As the new season approaches, the brand releases one of its high impact-ready trainers in a broad array of new colorways. They pay homage to some of the prominent US colleges, including Ohio State, Florida, Michigan, Oregon State, among many others. Check out the brand's official website to find all of the available options.